This is a white cake with a sugar cookie in the center. It is iced with buttercream icing. The baby is made out of fondant and the butterfly is made out of chocolate. 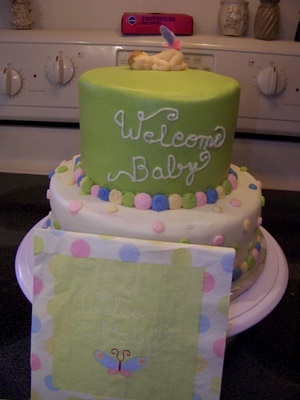 This cake was made to match the theme of the baby shower which is shown with the napkin. Sizes: 9″ on the bottom and 6″ on the top.